I have just come to the end of my power phase in training; a 6 week block that has seen me doing assisted one armers, weights, campussing and lots of power climbing. So now, with David’s help and planning, I am moving on to power endurance (PE). The idea behind all this training is to be strong for the World cup circuit this year and also for our trip to Colorado this summer- so a lot to be excited for and a lot to persuade me to do “just one more” in my training. This is the first time I have ever trained in an organised way for so long. I have done the odd few weeks of this and that over the years but nothing to this degree. It will be interesting to see how it benefits, I think already I am a lot stronger for it. One of the great things I find when training is to keep a record in some kind of diary. Mine is called “Mina’s training book of self-loathing”! It helps to look back and see improvement and also to write down when you train, what you eat etc. Yesterday, in preparation for PE, I went to see Tom Randall and have a go at his power endurance tests on his board. We looked at anerobic capacity and also low end aerobic capacity. This essentially looks at the power end and the endurance end of PE. 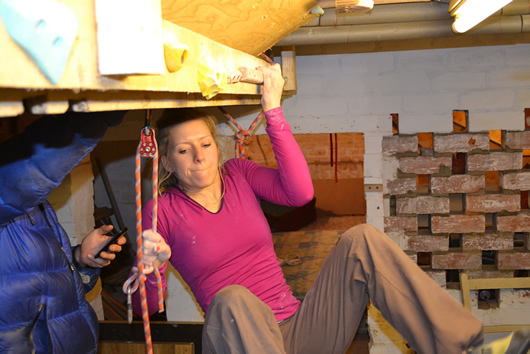 We also did a one arm strength test to put the endurance in the context of my strength; thus enabling us to get an idea of my efficiency when climbing. Hopefully, after 8 weeks of training I will do these again and be better! So this week is the beginning of my PE phase; today is the first proper training session. Wish me luck!